Air rifle is one of the most accessible and high-precision weapons, though used mainly for target shooting at distances of no more than 50 metres. A good spring air rifle today can be purchased in any specialty store, the price is about 200-300 us dollars. The first thing to do after purchase is carefully calibrated brand new "airguns". The majority of the arms factory supplies its products in dealer stores in canned form. This is true not only of Pneumatics, but also other, more serious types of weapons, smoothbore shotguns and rifled carbines. In the process of reactivating the need to disassemble the rifle and with a cloth soaked in gasoline, dry thoroughly life factory lubricated internal mechanism and the barrel. After removal of lubricant all parts of the rifle should be wiped dry with a cloth. This may seem strange, but after removal of the factory lubricants, must again go to the grease! This time should handle all the friction parts of the mechanism of special oil spray, which in the future will contribute to the reduction of wear. In addition, gun oil spray is a great tool for tight blockage of possible micro-cracks on the barrel and other components of the rifle. By the way, micro-cracks can significantly reduce the compression rifle, thereby adversely affecting the sharpness and accuracy of the battle. You should not be afraid too loud the first shots fired from a new rifle. As long as all the details of spring-piston mechanism is not lapped, the rifle will shoot that way – loudly and with great emissions from barrel burning. 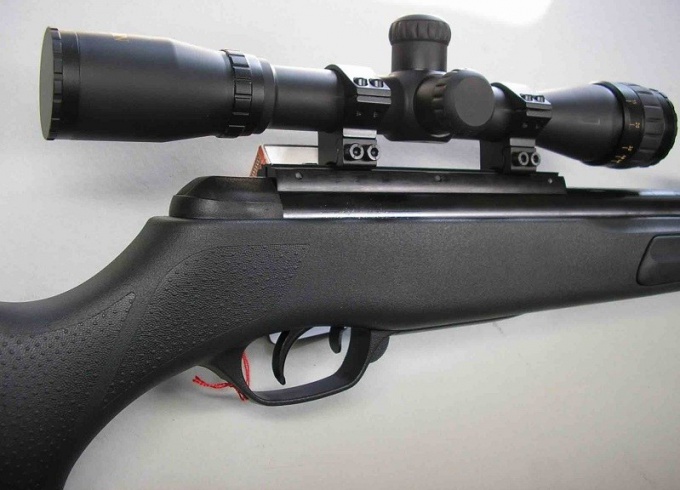 Before you start zeroing airguns, you should make sure that the sights are in good condition. So, the location of the fly must be smooth, besides "sit" on the barrel it is hard and no signs of backlash. The same applies to the screw of the aiming device. Manufacturers of airguns is recommended to start the zeroing rifles from a distance of 25 meters from the target, while the shooter is in the prone position. In no case should not be at the sighting clamping the rifle in a vise or any other clamping device. Targeting a weapon, you need to "work" as the center of the target, and its lower shear. You need to shoot lots of three-four shots, gradually adjusting and adapting themselves to all the sights.